Trees, landscaping, and the Lester family have been together since the late 1950s, when Gregory Forrest Lester went house-to-house with his father, Vernon Lester, spraying trees for insects and selling plants from the back of a two-ton truck. Whenever they made a sale, Gregory stayed behind to put in the plants while his father went ahead to knock on the next door. A lot has changed since then. 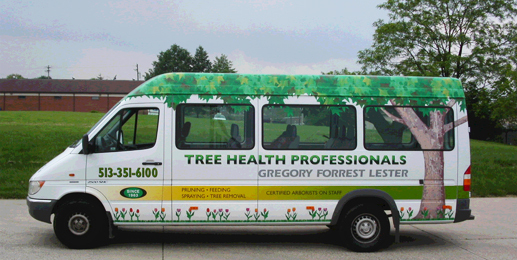 Incorporated in 1963, Gregory Forrest Lester, Inc now employs up to 20 workers, including six certified arborists; and tree care is a specialty, along with a full complement of landscaping and masonry services. In addition to tree services for residences, the company has provided tree services to five municipalities in the Cincinnati area and over two-dozen churches, along with condo associations, apartment buildings, builders, restaurants, schools, banks, hospitals, auto dealerships, post offices, and retirement communities. Of course granddad’s original 2-ton truck has been replaced many times over. In 2007, for example, to continue living up to its service standards, the company purchased eight new vehicles, including two bucket trucks that make tree pruning and removal go faster while helping avoid lawn damage. But some things haven’t changed. Gregory Forrest Lester, Inc. still has the feel of a family business, with a third generation of Lesters making up nearly half of the workforce. And the focus is still on listening carefully to customers to find out what they really want and then providing timely, professional service. Jeff Lester – ISA Certified Arborist, MBA – Xavier University, CDL Class A, Licensed Pesticide Applicator, Fluent in Spanish, ISA member. Kevin Lester – ISA Certified Arborist, Certified Crane Operator, CDL Class A, ISA member. Sean Lester – ISA Certified Arborist, ISA member. Greg Lester – ISA Certified Arborist, Licensed Pesticide Applicator, ISA member. Alan Young – ISA Certified Arborist, ISA Certified Utility Specialist, Licensed Pesticide Applicator, CDL Class A, ISA member. Cory Lester – ISA Certified Arborist, Certified Crane Operator, ISA member.